Danielle Cook’s son was only 11 years old when he was diagnosed with stage three Hodgkin’s lymphoma, a type of cancer that affects the immune system. “There was a huge sense of powerlessness and great sadness,” remembers Cook, a mother of three who worked for years doing cooking demonstrations in the Washington, D.C., area. Cook, who now also works as a holistic nutritionist, knew there would be comfort —and healing— in food. After months of making special recipes for her son who felt sick with little appetite, she saw the boy go from a “worn, depressed, tired kid to a healthy adolescent,” she says. 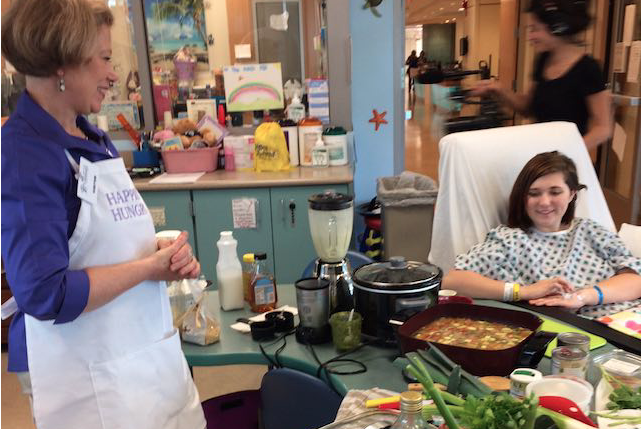 Drawing from her experience, she founded Happily Hungry, a program that consists of cooking and workshops for hospitalized kids and their families who are battling cancer and other illnesses.